Blending any two or more things together is a curious and complex act. In winemaking, grapes are often blended to combine extremes in character while simultaneously softening each. Foods may be blended for contrast: Lemon and butter combined, for example, make a classic sauce for pasta or fish that is both richly creamy and tart, a flavor profile that a single food can’t provide. Coffee is an absorbing case-in-point for a conversation about blending because of the seemingly infinite number of directions roasters can take in the process. One roaster’s goal might simply be to use up back-stocks of green coffee, resulting in haphazard blends designed with cost-savings as top priority. Another roaster might blend with specific customers in mind, combining different coffees to represent the flavor profiles known to be appealing to those who buy the final blends. And yet another roaster, perhaps the most creative, will have a vision for a potential blend after cupping through the coffees purchased each season. In these cases, the result can be an entirely new experience in the cup, a harmony of high-quality green coffees, each roasted to reflect the coffee’s maximum potential, then blended to show off the best attributes of each in a unique coffee expression. In this report, we take a deep dive into eight blends, all of which earned scores between 92 and 94. They are the top-rated from among a total of 64 blends submitted by roasters in the U.S., Canada, Taiwan and China. We also followed up by talking to these eight roasters to learn more about the blends and how each came to be. One theme that emerged was reassuring: In every case, these blends were born at the cupping table, sparked as ideas by roasters and their expert cuppers, who wanted to offer coffee-lovers something special. In other words, they were not a byproduct of the practicalities of small-business economics or the need to offer a category more mainstream roasters might be pressured to produce along the lines of a “House Blend” or “Breakfast Blend.” Quite the contrary; in most cases, these roasters also sell their blend’s components separately, as single-origin offerings, a further testament to their quality. Each of these artisanally crafted blends tells a story that originates in time and place, and we hope they will resonate for you as they have for us. Portland-based Water Avenue Coffee’s “Canoe Blend” (94) is a riff on the theme of water. Matt Milletto, vice president and co-founder of the company, says the blend is named in honor of the humble craft that is the symbol of so much he loves about Oregon, evoking memories of canoeing trips with his father, Water Avenue co-founder Bruce Milletto. Because this blend is also Water Avenue’s equivalent of a non-vintage Champagne—meaning the company strives for relative consistency every year, no matter what the final components of the blend—Milletto prefers not to reveal the precise origins of the individual coffees come from. ­But he did tell us that there are three coffees involved: a Central America, a South America and an Indonesia. This makes sense, given our tasting notes: Dark chocolate tones, perhaps, from the South America; our descriptor of nut-toned toffee might be attributed to the Central America component; and notes of rich sandalwood and forest floor perhaps from the Indonesia. 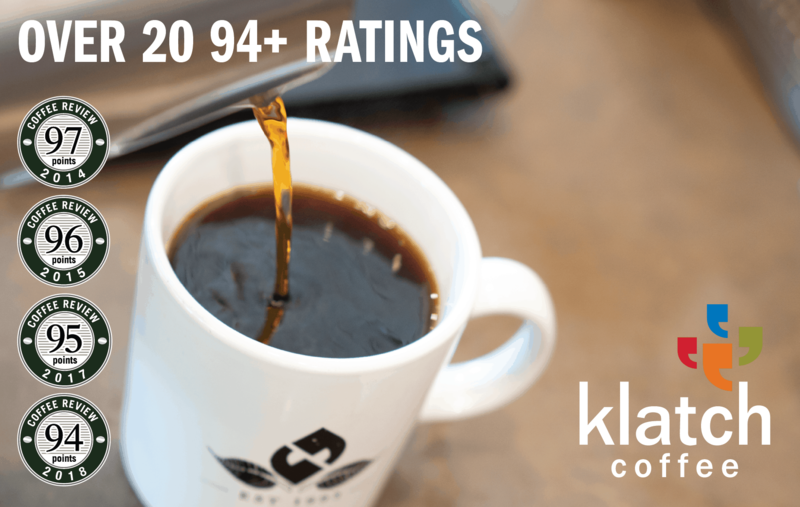 The blend attracted our top score of 94 for its enticing and surprising cup profile. Milletto goes on to say that, “Blending offers the opportunity to create a product that is relatively stable from year to year both in flavor and in price point. This is something we have found to be highly desirable, especially for our wholesale customers. It is also a chance to tap into another creative aspect of roasting. Creating a blend recipe is much like creating a recipe for cookies, bread or anything else; it asks you to draw on your technical knowledge of coffee, while also expressing something artistic.” And at $14 for 12 ounces, this coffee is a serious bargain by specialty standards. Corvus Coffee’s Dead Reckoning blend. Courtesy of Corvus Coffee Roasters. Dead Reckoning (93) is sold primarily as espresso, but for this report we cupped it for brewed applications, finding bright, engaging acidity and notes of honeysuckle, spearmint, pomegranate and nougat. The roaster’s goal was to create a fruity and juicy blend that was also chocolaty, and Goodlaxson found that the trick was to work backwards from a flavor—in this case, sweetly tart fruit—and to add both natural- and washed-process Ethiopias to the base of coffees from Central America that constituted his starting point. An earlier version of this perennial blend was featured in our Holiday Gift Coffees report for 2016 and remains on Per’La’s menu as a seasonal holiday coffee blend, always developed with the same goal: an evocation of tropical living. Given that Florida’s winter could pass for eternal summer in much of the rest of the U.S., it is apropos that “Miami Winter” (93) is like a tropical breeze: ginger blossom, pineapple and orange marmalade lead the flavor notes for this lively combination of Kenya and wet-processed Ethiopia coffees. It’s fruit-forward, though not overpoweringly so, elegant and deep. Per’La Specialty Roasters’ Miami Winter Blend. Courtesy of Per’La Specialty Roasters. Caesar Tu, owner of and head roaster for Kakalove Café in Taiwan, is well known to Coffee Review for his impeccable sourcing and roasting across a wide range of coffee offerings. He took a poetic approach to naming this blend, comprised of four coffees. He was listening to a song in D major when he roasted the coffees, so he deemed it “D Major Blend.” But his colleagues who tasted it convinced him to change the name to “Wilderness Blend” because, for them, it evoked a remote wilderness hike, serene and relaxing. The coffee is a blend of two Ethiopias (a washed and a natural Yirgacheffe from the Adado washing station), a Kenya (from the Mukangu washing station) and a honey-processed El Salvador (from Finca Guayabo). Sorting cherries at Finca Guayabo in El Salvador. Courtesy of Zoe Shih. Tu’s primary goal for the blend was to present a sweet coffee that would be light-roasted, yet low in acidity. A common complaint Tu hears from local coffee-drinkers is that lighter roasts strike them as too acidy. So, he developed the roasts of each component a bit longer than he normally would to slightly reduce the perceived acidity, but maintain sweetness. Roaster and Kakalove Cafe owner Caesar Tu checks the progress of his roast. Courtesy of Echo Liu. This blend’s lighthearted name belies the heavy-hitting nature of the bag’s contents: Panama Finca Deborah Caturra Natural; Panama Finca Hartmann Natural Geisha; Panama Finca Lerida Natural Geisha; and Ethiopia Sidamo Mulish Natural—all coffees with impressive pedigrees in their own right. “Naturals With Attitude” (93) is an unapologetic anthem to dried-in-the-fruit or natural-processed coffees, a blend intensely fruit-driven (bergamot, mango), anchored by notes of sandalwood and baker’s chocolate. Finca Lerida in Panama, where one component of Temple Coffee’s “Naturals With Attitude” blend was produced. Courtesy of Temple Coffee and Tea. Temple’s head roaster Jake Deome working on a Probat UG-15. Courtesy of Temple Coffee and Tea. While San Diego-based roaster Bird Rock’s owner Jeff Taylor focuses 95% of his energy on single-origin coffees, he thinks blending can be useful if it elevates the cup profile of its components. He also likes to give his quality-control team, lead by his wife, Q-grader and roaster Maritza Taylor, a chance to showcase its collective talents. The Valentine’s Day packaging for Bird Rock Coffee’s Love Letters Blend. Courtesy of Bird Rock Coffee Roasters. Designed as a Valentine’s Day blend, “Love Letters” combines producer Anny Ruth Pimental’s Loma La Gloria red-honey-processed coffee from El Salvador with a Sumatra wet-hulled Tano Batak. The cup juxtaposes spicy lavender-like florals with notes of fine perique pipe tobacco, moist and earthy-sweet; it also displays a particularly syrupy body. It’s perhaps not a coincidence that Pimental is getting married later this year. This blend is Bird Rock’s homage to both the Valentine’s Day holiday and to one of its favorite farmers, and it’s packaged as a limited-edition gift that includes a postcard for writing your own love note. Gary Thiesen’s behind-the-scenes description of Montana-based Revel Coffee’s blending process is that it often starts with a specific request from a wholesale client, which might be as vague as “something bright” or “something fruity.” The next step is to sit down and taste through a range of brewed single-origin coffees together, in order to gauge what the client likes and develop a shared sensory vocabulary. Then Theisen composes several blends of brewed coffees before selecting one. He refines the roast profile of the target blend over several iterations before presenting it to the client. A farm in Cauca, Colombia whose coffees comprise part of Revel Coffee’s Throwback Blend. Courtesy of Cafe Imports. Theisen calls this blend “Throwback” because it evolved out of Kenya-Colombia blends he routinely experienced as a young roaster learning the trade, the Colombia balancing and grounding the intensity of the Kenya. This coffee is also the best value on our list, at $13.75 for 12 ounces. This blend combines beans from Tarrazu, Costa Rica and Yirgacheffe, Ethiopia, and was named in a playful exchange among the Roast House staff, who appreciated the pun on “coast-to-coast” that paired “Costa” of Costa Rica with “Coast” to represent the distance between the Central America blend component and the Ethiopia, a far continent away. Also designed primarily for espresso, Roast House’s “Costa Coast” blend (92) cupped beautifully for brewed applications. 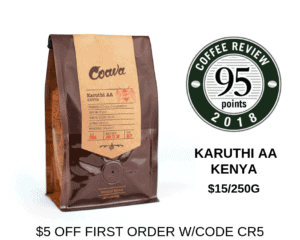 The Ethiopia component here is the same Roast House Dimma #9 Ethiopia Natural that scored 93 in our holiday report of December 2017, and its notes of dried strawberry and spice-toned florals resurface here alongside toffee and hazelnut butter suggestions introduced by the double-washed El Balar Costa Rica. Aaron Jordan is very happy with the Ethiopia DIMMA #9 that just arrived at Roast House. Courtesy of Roast House. Of the 64 coffees we cupped in our exploration of blending, the eight that rose to the top of our ratings supported our basic conclusion: The best coffee blends are artisanal products, thoughtfully developed by roasters to create a unique sensory experience through the combination of complementary and disparate flavor elements contributed by high-quality green coffees. Although some of these blends turned out to be striking values given their quality, none appear to have been created to fulfill market categories or to cut costs, but instead to create entirely new coffee experiences. Though the only goals we began with were to survey the market in order to learn what blends are available to consumers and to evaluate them on the cupping table, we ended up discovering other questions. Why blend? How can blends tell a story or evoke a memory? How can single-origin coffees be transformed, and perhaps improved, by blending? Some answers came by way of these fine blends and our conversations with their creators.